John Coll, originally from Taylor’s Hill Galway and now living in Dublin. After an initial career as a marine biologist John Coll turned to his passion for making sculpture fulltime 30 years ago. 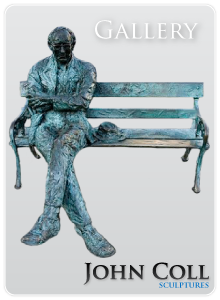 Since then he has become one of the best known figurative sculptors with many public works such as the monument to Patrick Kavanagh on the Grand Canal at Baggot Street, Dublin and his celebration in bronze of Brendan Behan on the Royal Canal in Drumcrondra, Dublin. 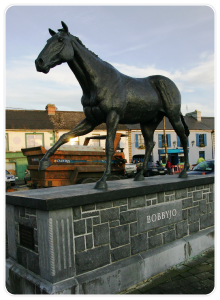 Other large-scale works include a life-size portrait of the racehorse "Bobbyjo" and a 4-meter monument to Countess Markievicz at Rathcormac, Co Sligo. His most recent commission is a 4.5-meter sculpture of the Galway footballer legend Enda Colleran for his hometown of Moylough, Co Galway. Semperit "Car of the Year", in 1999, 2000 and 2001. Ford/Independent Newspapers Spirit of Life Awards, 1998 and 1999. Evening Herald/Eircom Dublin Theatre Festival Awards 1998 and 1999. National Newspapers of Ireland Advertising Awards 1999, 2000, 2001 and 2002. IMROG/TG4 Traditional Music Artist of the Year 1998, 1999 and 2001. Kellogs Nutrigrain Women All Ireland Golf Trophy Award 2001. One-man shows in the Kenny Gallery, Galway, Ireland in 1985, 1987, 1989, 1991, 1993, 1995, 1998, 2000, 2002 and 2005. One-man show at the Sligo Arts Festival, Sligo, Ireland in 1988. Participant in Group Shows in the James Gallery, Dalkey, Co. Dublin, Ireland. "The Light Behind the Written Word", a exhibition in the Allied Irish Bank Centre, 405 Park Avenue, New York, in 1998. 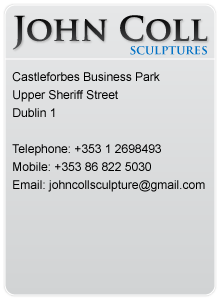 A one-man show comprising twenty five cast bronze sculptures inspired by Irish writers and their work. Exhibited at all the major national shows in Ireland, including the Royal Hibernian Academy (1991, 1992,1993), and the Oireachtas Exhibition (prize-winner 1988). 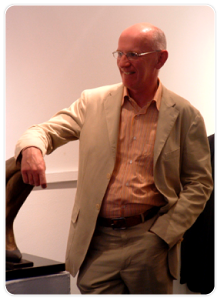 Founder member of the Western Artists Group (founded 1988). Exhibitions with the "Island Connection" group in Spain (1993) and Ireland. Participant in an exhibition of Contemporary Irish Art, in Boston, USA in 1990. Participant in "Espace", an exhibition of works of fifty sculptors form all the European Community member states, held in Dublin in 1991, to celebrate its status as European City of Culture. Participant in "Famine", an exhibition organised by the George Moore Society in Claremorris in 1995. This exhibition travelled to the USA, Canada and Northern Ireland. It commemorated the 150th anniversary of the "Great Famine" in Ireland, and comprised works by 35 invited artists on the famine theme. Amsterdam Sculptors Collective Invitation Exhibition in 1997. "Border Crossing", an exhibition of eight Irish artists in Gallery Ravel, Spring Street, Soho, New York in 1998.